Now that the 2018 season is officially in the books, we can now take a look back at the season through the eyes of each NFL team and using the grades and statistics that we have compiled, we and detail what went right, what went wrong, and explain what that team has to look forward to. Below is the 2018 season recap for the New Orleans Saints. The New Orleans Saints were one of the league’s best all-around teams, earning the No. 1 seed in the NFC before a disappointing loss to the Los Angeles Rams in the NFC Championship game. QB Drew Brees put together an MVP-caliber season in 2018, leading all quarterbacks with a 94.7 overall grade. 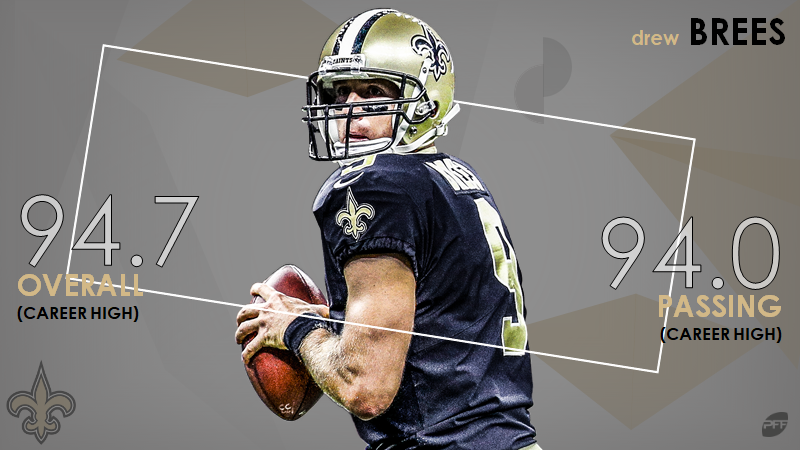 Both Brees’ overall grade and passing grade of 94.0 are career-highs. 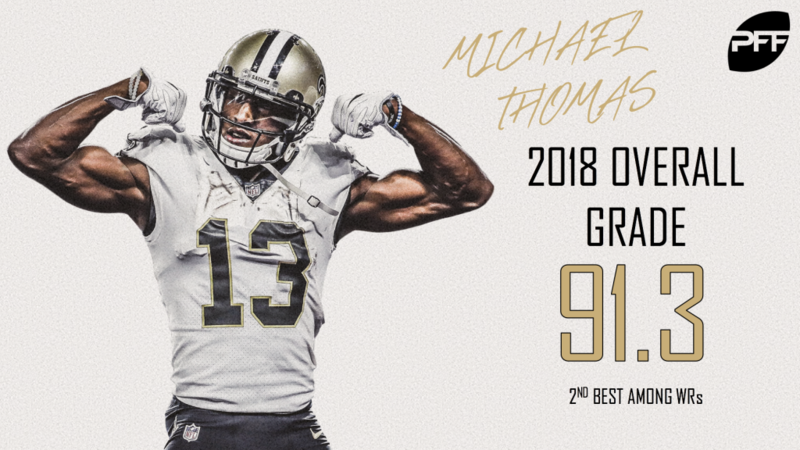 WR Michael Thomas put together yet another stellar season, finishing second in overall grade at 91.3. Thomas was as sure-handed as ever, registering only a 2.3% drop rate on 128 catchable targets. 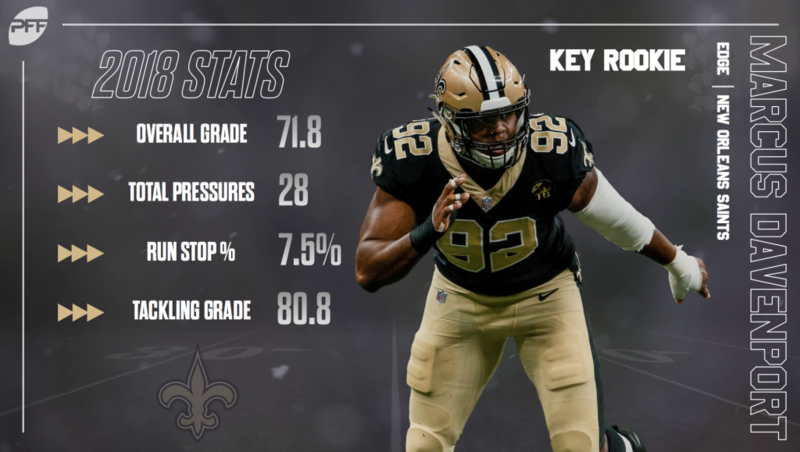 The Saints’ run defense was dominant throughout the season, grading as our third-highest rated unit. 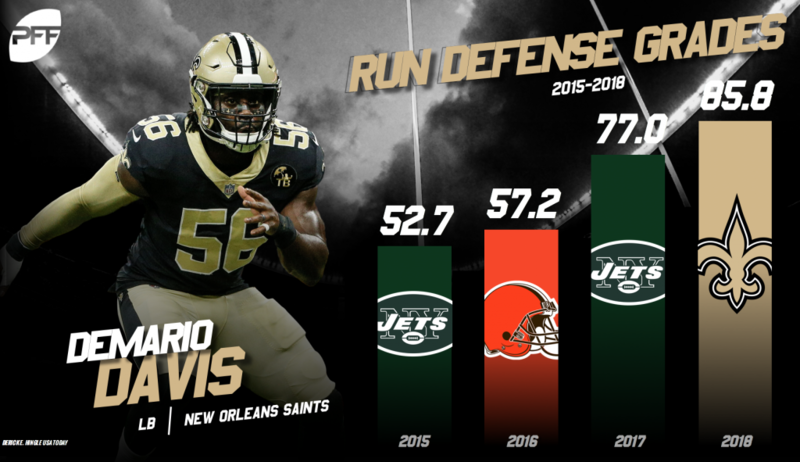 Vonn Bell, Cameron Jordan, and Demario Davis were defensive stalwarts for the Saints, registering run-defense grades above 85.0. Despite Drew Brees’ success, the Saints lacked depth at the wide receiver position. 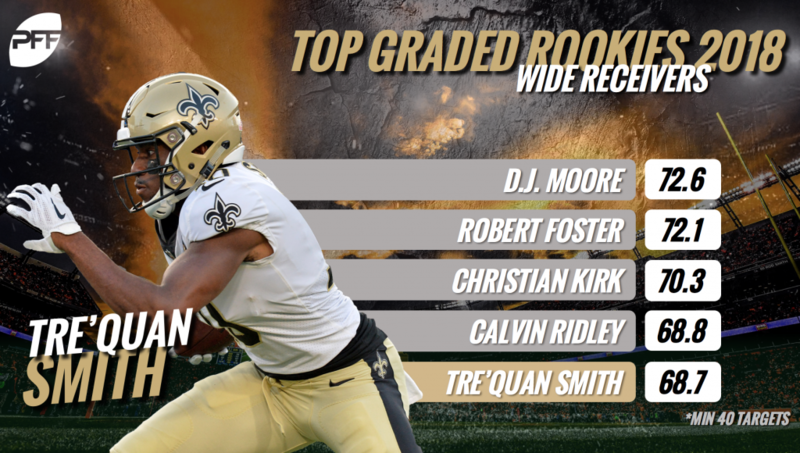 After Michael Thomas, the only other receiver on the team to eclipse 250 yards receiving was rookie Tre’Quan Smith (409), who finished with an overall grade of 68.7. 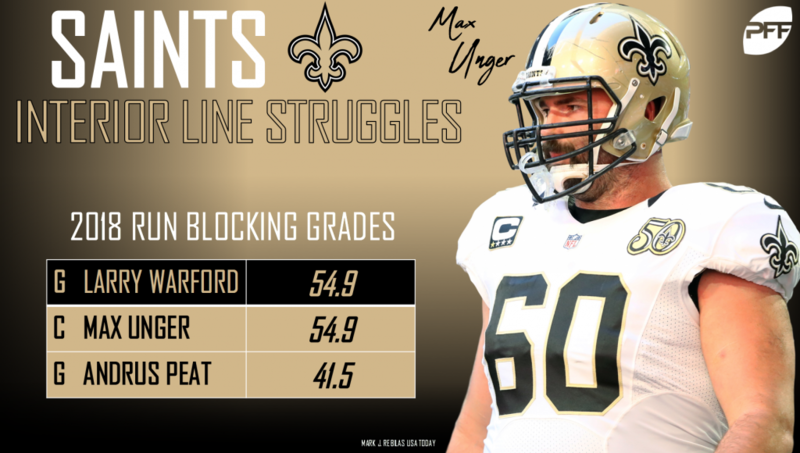 The Saints’ run-blocking unit took a step back this season ranking 18th as a team while seeing their yards per rushing attempt drop from 4.8 in 2017 to 4.4 in 2018. The interior linemen especially struggled, as none of the regular starters finished with a run-blocking grade above 55.0. Pass coverage was another area where the Saints regressed in 2018-finishing in the bottom-10 of grading. 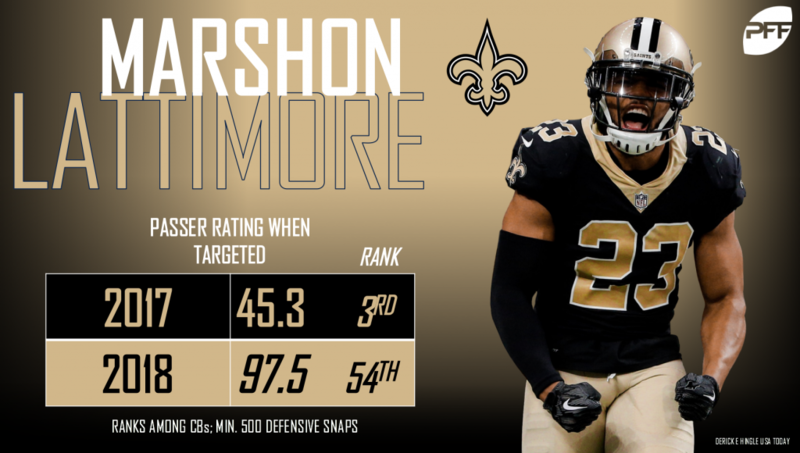 While CB Marshon Lattimore still led the team in coverage grade, the second-year pro allowed an NFL passer rating of 97.5, up 52.2 points from just a season ago. Brees was the highest-graded player on the offense, as well as the highest-graded quarterback in the league on a throw-for-throw basis. He had the NFL’s lowest percentage of negatively-graded throws. 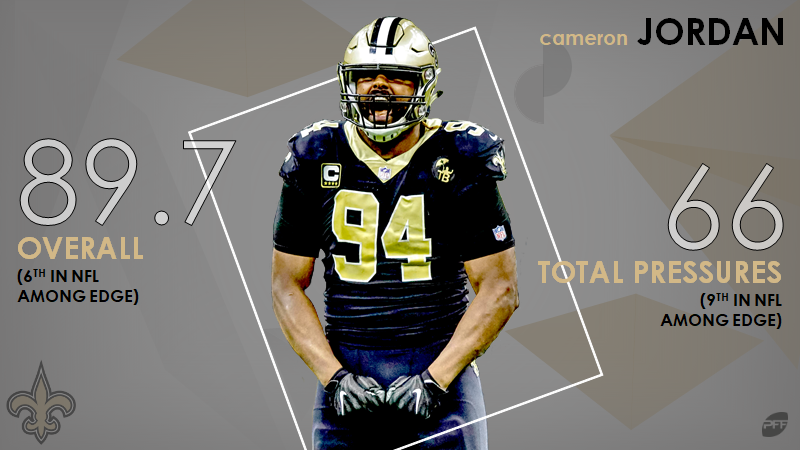 Edge defender Cameron Jordan posted the team’s highest grade on the defensive side of the ball at 89.7 overall, ranking sixth in the league among edge defenders and finishing ninth among the same group with 66 total pressures. DI David Onyemata was quietly the Saints’ second-highest graded defensive player during the regular season at 83.5. In a breakout season, Onyemata was effective both in the run game and as a pass-rusher, producing 34 pressures while amassing 24 defensive stops. Edge defender Marcus Davenport contributed both against the run and the pass a rookie. In 13 games, Davenport engineered 28 total pressures while finishing second on the team with a run-stop percentage of 7.5%. The Saints had an outstanding 2018 season, and they’re positioned for even more success as long as Drew Brees remains at the helm.